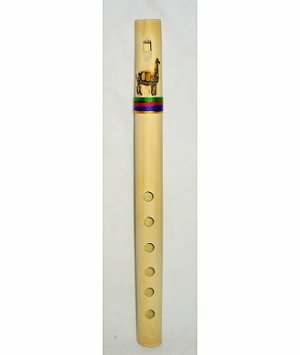 Although its origin is unclear, the bamboo flute is one of the oldest and simplest musical instruments of ancient cultures because bamboo grows in most climates of the world. These simple bamboo flutes are made with high-quality, natural materials and are carved and hand-painted with an alpaca imprint at the top! Two sizes available. Sizes: Approximately 10 inches and 15 inches long.